Tanking up at the buffet near a sunny window with … I think these are octopus balls because of the tentacles… curry chicken, grilled fish, potato pancakes, orange slices, mmiso soup, rice with sprinkles and pickled vegetables. Every good day of photography starts with a good breakfast! Godzilla raises his immense mass from the buffet table and lets out a mighty roar of conquest. Other patrons flee, panicked by the earth shaking sounds exploding from the mighty thunder lizard! The mighty thunder lizard also has a mighty sunburn from his day in the hot sun in Sawara. Today I’m heading to Kyoto on the Shinkansen, but there’s little hurry so I walk down to Narita to photograph the geomancy animals and other points of interest in town. Narita is a very handsome town for photography with its winding streets and traditional architecture. I’ve discovered that there is much to see in Narita than just a convenient airport town too, including a calligraphy museum, and a cream filled pastry shop people line up to get into to. I plan to return here if possible, perhaps before the flight out of the country. Also Ino Tadataka’s house in Sawara, when they’ve finished the renovations. The Nex apparently runs between Narita Airport, Chiba, Tokyo and Yokohama. To get to Tokyo from Narita you have to take one of the “Rapid Express” trains, not a big deal but not as fast and plush as traveling on the Nex. The ticket office gives me two tickets: A Rapid Express train and a connecting Shinkansen ticket. Hoofing it down to the platform and there’s just enough time to purchase a Match vitamin drink from the vending machine, conveniently located on the platform. The train arrives and leaves the platform 5 minutes after I purchased the tickets. Bound for Tokyo via the Rapid Express and camera in hand, the scenery outside the window is lovely under a blue sunny sky! 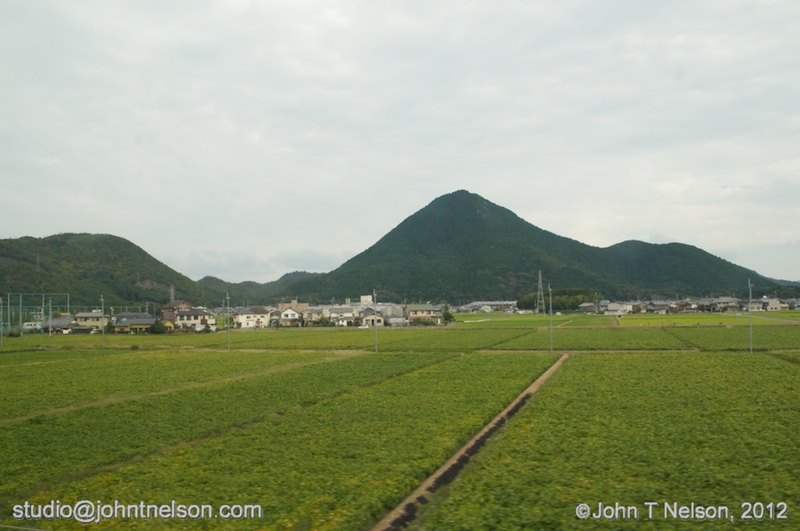 Japanese countryside, rice fields, mountains, shrines, towns and homes all roll by and every station we stop at greets us with throaty chirping birds singing in the stations. Needless to say I have both the video camera and my Nikon D300S DSLR at the ready to capture the moment. I didn’t think that we’d make so many stops and this concerns me because this is supposed to be the “Rapid Express,” two words that don’t go along with “local stops.” I can’t imagine we’ll arrive at Tokyo Station by 12:33, though and I’m wondering if I haven’t boarded the wrong train. At least we’re headed in the right direction, because I can see Tokyo Sky Tree up ahead. And we arrive at Tokyo Station with 15 seconds to spare! I rush through the station to get to the Shinkansen platforms, as are thousands of other travelers. I recognize much from my last stay in Japan but much has changed from the expansion project they started five years ago. I pass by the central Shinkansen ticketing desks and since I’m headed to Kyoto, I follow the signage to the Tokaido line platforms. I’ve ridden the Tokaido line Shinkansen before so it’s all familiar and wonderful, and I also notice changes and renovations to the station itself. And what a mob scene Tokyo Station is! The way this works is, you’re supposed to run both tickets through the machine at the same time. That’s how they make sure you are using the connecting trains in proper sequence and not exiting the system. I hoof it with all my luggage to my assigned car with only 5 mins to spare. And that’s lugging three pieces of luggage up a couple flights of stairs to the Shinkansen platform. You’d better be in shape if you want to run this gauntlet and time table without mistakes. Since in past trips, I’ve relied on JR Pass, my Shinkansen travels have never included the Nozomi trains, but since I’m paying out of pocket, this time I get to ride the fastest (well almost) bullet train in the fleet, the platypus billed Nozomi Series 700. THe Shinkansen leaves Tokyo Station right on time and roars down the tracks with all the sinewy power of a jungle cat. Mountains, plains, the Pacific Ocean and even wind farms speed past us as we head towards Kyoto and then Shin Osaka. Once out of the Kanto plain, Japan turns very mountainous. They say that 70 – 80% of the country is actually mountains. I could video tape this scenery for hours! The conductors always bow to the car as they exit and always always step aside to let a passenger pass by. Nice respectful touches. Japanese people are QUIET. Not a sound can be heard on the train other than the turbine growl of the train itself. Not a word is spoken except for the occasional child babbling and even then children are hushed by their mothers. Riders are urged to put their cell phones on silent. It’s fortunate that I was assigned a window seat, because I like watching and photographing the scenery as it races by. Unfortunately, I was assigned a left-hand window seat which means you can’t see Mount Fuji or the five story pagoda of Toji Temple in the center of Kyoto.